Buying The Best Electric Brad Nailer Guide - Avoid The Confusion! Buying The Best Electric Brad Nailer Guide – Avoid The Confusion! Whether you are a professional or a do it yourself individual, one tool that you will find useful in your home is a brad nailer. Brad nailers are usually the best options for individuals who would like to put small pieces of wood in place or together. The brad nailers are also great for trims and extremely versatile during home improvement projects. Depending with your skills and scope of projects, you can use a professional level nailer or non-professional level nailer as all you need is the basic knowledge on how to use them as well as safety and maintenance tips. While you should have basic knowledge on how to use a nailer before starting any project, you can easily learn how to use them as well as maintain them by reading their instructional manual and thus, there is no reason why everyone should not buy a brad nailer. A quality brad nailer will work efficiently and can handle different projects with no issues. Whether you are looking to change a door casing, a window, add light trim crown baseboards, a quality brad nailer is a highly useful tool to have around your home as it makes upgrades and renovations easy as long as you have the necessary know-how and skills. In addition to home renovation projects, the electric brad nailers can also be used in other projects like making chairs, cabinets and other sorts of furniture as well as in crafts and toy making. Furthermore, once you buy an electric brad nailer, you will find other creative ways to use it such as building fences, flooring projects, and construction projects as long as you understand its functionality. My Choice? The same one as I choose for the best battery powered. One thing you will notice once you start shopping for the best brad nailer is that there are many options on the market, which can be confusing to most inexperienced shoppers. To begin with, you must differentiate a brad nailer from a finish nailer. The brad nailers are smaller in size than finish nailers. The brad nailers also use thin 18 gauge nails to piece together lightweight trims while finish nailers use lighter 14 to 16 gauge nails. It is also worth noting that finish nailers are used for finishing only while brad nailers are highly versatile. The versatility of brad nailers makes them ideal for various projects that include patching, attaching, and framing light wood trim into place. Furthermore, the brads used on brad nailers usually have a thin flat head that is usually invisible over the wood trim, which means that you do not need to use wood putty to hide the nail hole. It is also worth noting that brad nailers can be categorized into three types that include corded, pneumatic and electric. The pneumatic brad nailers use compressed air to energize the compressor and power the units. They are lightweight and offer a clean finish but you will need to constantly replace the hose and check oil, which makes them difficult to maintain. 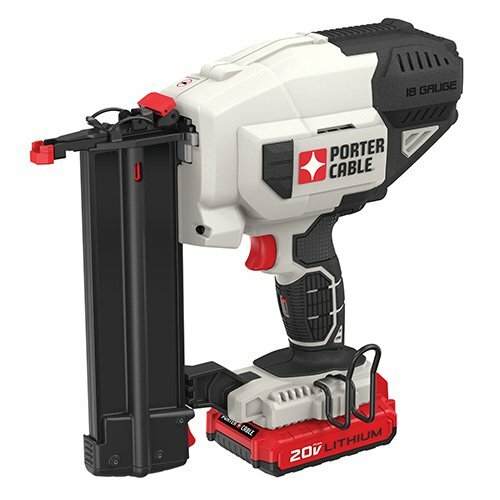 The corded brad nailers are the most expensive and use a rechargeable battery, which makes them portable. The electric brad nailers use a motor to drive the brads into the trim and thus, get the project done quickly and efficiently. The electric brad nailers require minimal maintenance and thus, cost-effective in the long run. Therefore, if you are considering buying a brad nailer that will help you easily and efficiently undertake upgrades without much maintenance work, you should buy an electric brad nailer. A high-end electric brad nailer will not only help you fix or upgrade your wood projects but it will help you do so quickly and more efficiently. Nevertheless, in order to find the ideal nailer for your home projects, you must know what to look for when choosing a best electric brad nailer as different tools come with different features. You must realize that some brad nailers cannot accommodate some brad nails due to their length. To be on the safe side, you should look for an electric brad nailer that can accommodate nails of up to 2 1/8 inches. A nailer that can work with nails of different length is usually the best as it offers you versatility, which makes it ideal for different projects. Another important factor that you should consider is the size of the nose. A top quality electric brad nailer should have a smaller nose size for better results. Brad nailers with non-marring rubber nose tips are usually the best as they guarantee clean finish results. It is also beneficial to buy a brad nailer that is highly adjustable. Since different jobs will require different settings, it is good to ensure that the tool depth and power source settings can be easily adjusted. It is also cost effective to buy a unit that comes with a comprehensive warranty as you do not know when a problem can occur. When it comes to finding the best electric brad nailer, you should look for the one that lets you easily and conveniently adjust the power settings from high to low. The ability to adjust power gives you control over the tool ensuring that you do not exert a force that can split the wood surface. The electric cord should also be long enough to give you flexibility between the power source and the workspace. It should also have a soft-grip handle for comfortable grip.